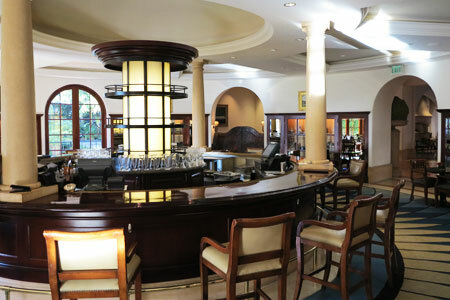 Meet for a drink or linger over a full meal at this bar at Bacara Resort & Spa. : Located off the lobby of Bacara Resort & Spa, this lounge encompasses a circular bar and the outdoor "Ocean Terrace" overlooking the Pacific. It's a great place to meet for a drink and then linger longer for a full meal if you so choose. The bill of fare is short but versatile, giving guests the option to indulge in Champagne and caviar or kick back with chicken quesadillas and a local beer like Hoppy Poppy IPA from Figueroa Mountain Brewing Co. in the Santa Ynez Valley. There is also a sushi menu presenting nigiri, sashimi and specialty rolls along with a brief selection of sake by the glass and bottle. Other offerings include specialty martinis and barrel-aged cocktails. Cognac connoisseurs will be pleased to find Louis XIII de Rémy Martin ($75 for a half ounce; $300 for two ounces).